Is Reed Too “Far Out”? I usually find at least one article in the magazine that interests me, but that was not the case with the most recent issue [June 2011]. The articles were eclectic, to put it mildly, and none of them were interesting to me. I looked at the picture of the parade at a reunion and I thought how different Reed is today from when I was a student in the fifties. I could not imagine myself participating in this type of what I would have to call a spectacle. I received an excellent education at Reed, but I have to say that I feel very little attachment to Reed. I felt that Reed was a unique place, then, but judging from what I saw in this issue of the Reed magazine, it strikes me as being really “far out” today. I know I am far too conservative for the present Reed College. Editor's Note: Sorry you found nothing of interest in the last issue. We try hard to offer something for classmates of every vintage and persuasion, from the left of Hugo Chavez to the right of Attila the Hun (and there are alumni at both ends). We are probably guilty of playing up Reed’s quirky side—after all, bike jousting makes for better copy than biophysics. But don’t judge the college by its pageantry. Judge it by the rigor of its curriculum, the dedication of its professors, the brilliance of its students, and the achievements of its alumni. The clothes, the hairstyles, and the tattoos have changed; the essentials, I suspect, have not. The worries about the Reed student body being insufficiently diverse are motivated by many good desires for the college and for society as a whole. I agree with Joel Batterman ’10 [Letters, June 2011] that missing out on a variety of perspectives impoverishes the Reed community. However, I question the use of the current racial and ethnic percentages as a good way to measure the college’s “success” at encouraging diversity. Tracing the percentages of those who fall into which particular category succeeds most notably not in celebrating diversity but in reinforcing categories that are deeply flawed, hopelessly undefined, and always already in a state of flux. As an institution that celebrates critical thinking and challenges common perceptions of the world, Reed should be undermining (or at the very least restructuring) these categories, not maintaining them. Why is the institution known for “thinking outside the box” perpetuating categories that have such hazy boundaries and such arbitrary distinctions, as if “race” really is an appropriate measurable quality? Separating people into “Hispanic, African American, and Asian” categories is hardly more sophisticated than the old neighborhood covenants designed to keep “Mongoloid, Asiatic, and Negroid” races out of the suburbs. Simply creating less offensive category titles in the name of progress does very little to address the fallacies of racial categorization in the first place. 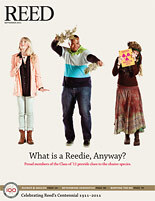 The article “The Quest Goes Live” (Reed, March 2011) states that the Quest board’s decision to launch reedquest.org was bolstered by a referendum showing a majority of students in support. This is the complete opposite of what happened—with one or two minor exceptions, a majority of voting students (in total and from all four years individually) rejected the idea both as a whole and with respect to every given type of article. Senate and the Quest simply did not take any action in response to the vote. Also, it is not true that the Quest remained “stubbornly confined to print” for 98 years or that the Wild Wild Quest changed this fact even during last semester: various other websites have existed for brief periods in the past, and sin.reed.edu/quest/ was already up and running smoothly many months before reedquest was ever announced. Editor's Note: We goofed. Only 40 percent of students supported an online Quest; 27 percent were opposed; and 27 percent neutral. This constitutes a plurality, not a majority. (Where are the poli sci majors when you need them?) We are sorry for this misstatement and for giving earlier Quest websites short shrift. Who Needs a New Building? In a world without the prospect of global warming, the plans for a new performing arts building might seem merely pricey and unnecessary. However, given that Reed’s greenhouse gas emissions are already high for a small college situated in a mild climate, the plan strikes me as downright extravagant. Reed’s performing arts faculty are excellent, but should students be taught that only a palatial building will give them the “appropriate respect” they deserve?” Thirty years ago, my peers and I in the chamber orchestra, Collegium Musicum, and dance groups were happy with what we had, and that was before the Vollum auditorium was finished, let alone Kaul Auditorium. A giant winter garden that “frames the view” is for whom, one might ask? The many students who want to conserve the beautiful Pacific Northwest and wider world? Despite green touches, the huge vertical and horizontal space and luxurious rehearsal areas would be heated and cooled using fossil fuels. Over the next years, scores of students will be choosing the new environmental studies major (a choice we did not have when my petition in 1979–80 for an environmental major was not accepted). Imagine, though, how improved the environmental studies program could be if some of the $38 million budgeted for a greenhouse gas–intensive arts complex were invested there instead. Editor's Note: The architects assure us that the new building will be an icon of sustainability, employing natural lighting and heating whenever possible. For example, that winter garden will be illuminated by daylight and will double as the main ventilation pathway for the building. A “green roof” will dampen sound, reduce runoff, and improve thermal resistance. Sensors will eliminate wasted energy in unoccupied spaces, skylights will reduce dependence on electric light, bioswales will capture rainwater, and so on. For what it’s worth, your view about the adequacy of existing facilities was not shared by the late music professor Herb Gladstone, who long lamented the loss of Botsford Hall in 1962 and spent years agitating for a replacement [see In Memoriam]. The money for the building comes largely from donors who share Herb’s vision. Your point about the importance of environmental studies is unassailable, of course. Reed is proud of its new ES major and hopes to strengthen it further. We invite readers to contact the development office for more details.